Regular office hours are 8:00 am to 5:00 pm, Monday through Friday. 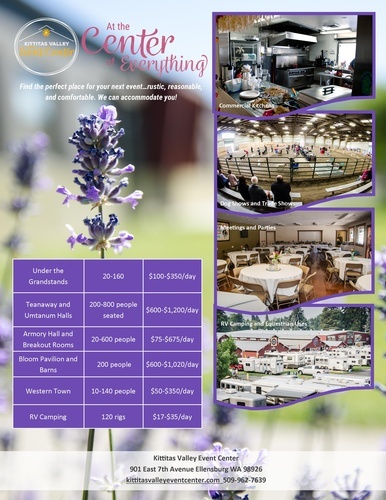 The Kittitas Valley Event Center is open all year round with facilities to serve everything from large art or livestock exhibitions to small business meetings and private parties. Adjacent to historic downtown Ellensburg, the Kittitas Valley Event Center is an easy drive from the intersection of I-82 and I-90, in the center of the state.